The proof is in the pump. See these often? As a consumer in the fitness world, it can be difficult to decipher whether claims like this are true. In fact, over the last decade, the Federal Trade Commission has filed 120 cases challenging health claims made for supplements (ftc.gov). We’re of the mind that transparency is key in the relationship between us and our customer. We’re confident in our product, and have the research to back it up. A double-blinded study is where neither the subjects of the experiment, nor the people administering it, know the critical aspects of the experiment. We used this method in the Creatop study to guard against both experimenter bias and placebo effects. In addition to the group of subjects that received Creatop, a separate control group received a sham “placebo” treatment which was specifically designed to have no real effect. An example page from the Schlesinger Associates study conducted in 2015. Schlesinger Associates has been a leader in the market research field for 50 years, perfecting the art and science of qualitative and quantitative data collection. We worked with Schlesinger to conduct a study of 52 participants on the efficacy and safety of Creatop. 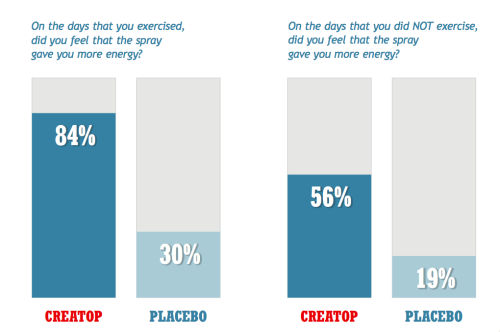 As you can see in this graphic above, 84% of the participants in the study said they experienced more energy on the days they worked out. This was especially exciting for us. We knew the product worked, but to physically see this kind of result was a great feeling. We’re proud of what we created and are so excited to finally share it with you after many years of research and development. Feel free to contact us with any questions about the product.